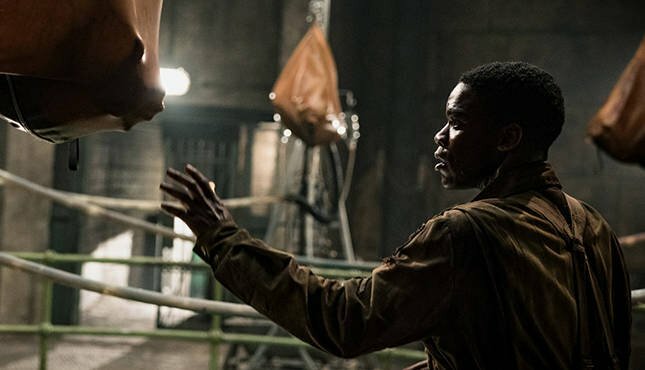 It's painfully obvious while watching Overlord, that the writer and/or director of this WWII zombie-ish action flick were big fans of the recent reboots of the Wolfenstein video games. In Wolfenstein, you play a muscled, all American man who mow's through an army of Nazi's. At the end of the games, you face off against a mecca-Nazi, half man, half machine. The end result of a war spent hunting and stealing all of the most advanced technology the world had to offer, and using it to build an army of SS super-soldiers. It's a cool concept and Wolfenstein is a cool game. And a lot of fun to play. The problem with Overlord, is that it often feels like you're watching a two hour cutscene in a video game you never get to play. Which is too bad, because the plot would fit the video game mould perfectly. A group of soldiers, survivors from a plane that was shot down over enemy lines, band together in a small French village to accomplish a mission that will enable American aircraft to penetrate the French countryside and bomb the enemy back into its German homeland. Things go from tense to horrific when the soldiers discover a church basement filled with evil Nazi experiments intending to create an army of super-soldiers by reanimating the dead with some mysterious liquid. See? Wolfenstein. The emphasis in Overlord is overkill. Overkill on plot, overkill on dialogue and most certainly overkill on violence. Like any zombie movie worth its weight in intestines, Overlord cranks the gore up to 11 and gleefully dares you to look away. Is it in bad taste to release a WWII movie that drapes gore all over the screen in such a cartoonish and ebullient way on Remembrance Day weekend? Yes, it is. But if the filmmakers cared, this movie would've come out in January. I can't fault this film for being bloody, I knew it was going to be and went to see it anyway. Buy the ticket, take the ride. What I fault it for is being a VOD quality film that somehow (in no small part thanks to JJ Abrams' involvement, no doubt) snuck its way into the multiplex. It's a good movie, for what it is, and it is fun, if you're a fan of gore. But it isn't a $13 movie. It's a $5 or $6 movie at most. Some reviewer at some point said that this was the 'Saving Private Ryan of zombie movies'. That's not only inaccurate, it's disrespectful. However, I will say that if you take Overlord for what it is, a Dead Snow type zombie war flick intent on blasting your ears with the grinding sounds of gunfire and exploding skulls, blasting your eyeballs with the sights of the same, and blasting your brain with the ever popular revenge fantasy fulfillment of killing hordes of Nazi's in small amounts of time, then it's about as good a film as it was ever going to be, or was ever going to try to be, for that matter.